5" A/O Sanding Disc, 100-C Grit PSA 8 Hole, 50 pk. 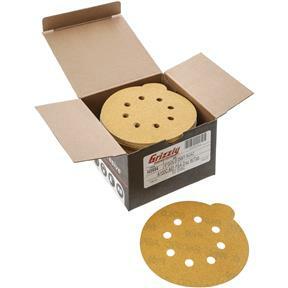 Grizzly H3554 - 5" A/O Sanding Disc, 100-C Grit PSA 8 Hole, 50 pk. These 5" 100 Grit sanding discs come pre-stamped pressure sensitive adhesive discs have a 8 hole dust collection pattern. Comes in a pack of 50. This is a repeat purchase for us..we've been very happy with the quality and price of these discs. This time we decided to buy a couple of different grits rather than just the one like last time. Looking forward to lots and lots of sanding on the fine pieces we make.